Paul Pierce has only played in 13 games in his 19th and final NBA season, but he's still holding court and talking trash—it just now happens before the game. It's two hours before tip–off at Madison Square Garden in early February. 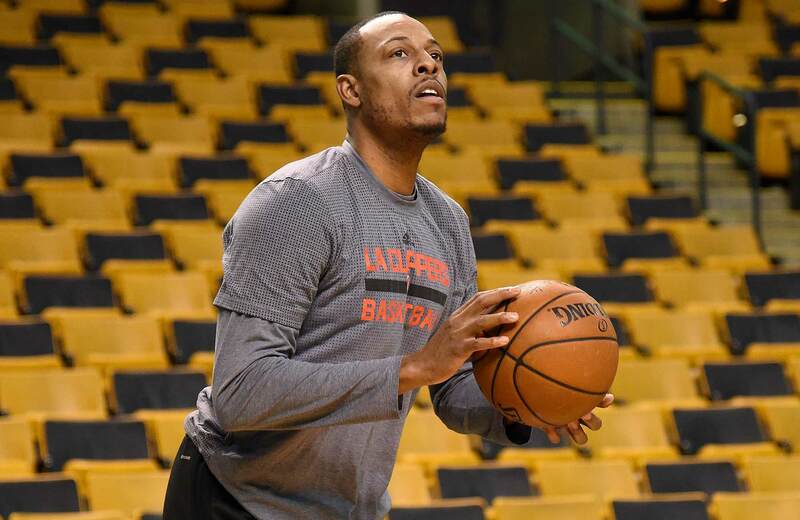 Paul Pierce, in town with the visiting Clippers, huffs and puffs and grunts on the hallowed court. The 19-year NBA veteran isn’t playing this evening, his final appearance at The Garden, but he’s engrossed in a pre-game workout with rookie teammate Brice Johnson. Seventeen years separate the wings—one harbors seemingly endless athleticism while the other has chiseled a career with guile—but they’re bound by the same position in this modern NBA. The two hybrid forwards are playing one-on-one within the confines of the Clippers’ offense. L.A. assistant coaches John Welch and Dee Brown mimic a high pick-and-roll, while one of Johnson or Pierce sits at the opposite elbow, tags the rolling big and then runs out to defend the other on the weakside wing. From there, one-on-one rules apply. Johnson catches on the right wing as Pierce charges at him. He freezes the veteran with a hesitation dribble, stutter steps and then glides past for a layup. “1-1,” Welch shouts. “That’s not a travel?” Pierce cries, his face scrunched incredulously. Now it’s his turn to counter. If Pierce can make the opening stationary catch-and-shoot on the wing, he’ll unlock an opportunity to attack Johnson live for another point. Both shots count as single scores in this game to 10, as the two Clippers rotate from each corner, the wings and the top of the key. Pierce slides out to the right wing and lofts a stationary three before Johnson can even get a hand up. As the ball clanks off the rim, he exhales an expletive. But Johnson can’t take advantage of the opportunity either, allowing Pierce to break the drought with a triple that rips through the net. Johnson can’t counter. Pierce needs two makes to best Johnson this evening. He drains the first stand-still three. And when the play is live, he fakes Johnson out of his shoes, takes one power dribble to the elbow, stops on a dime, and coaxes Johnson with another shot-fake. The rookie flies past him, as if Pierce were mere scenery outside a whirring train window. Pierce pauses, takes a breath, and drains the game-winner from the elbow where he’s crafted his legend. The loss forces Johnson to run a windsprint down and back the full length of the court. The rookie pauses before meeting his fate. “Boy, get running!” Pierce commands. Now with his third team following 15 years with the Boston Celtics, Pierce has morphed into more of a sage than a player. His lips flap with greater efficiency than his three-point stroke. He’s only appeared in 13 of the Clippers’ games this season, resting for a potential deep playoff run. Before one sequence in the footage against Stone, Pierce announces his pupil has grown fatigued and promptly, slips past for an easy layup. After Pierce finishes his spinning, Johnson wiggles around the stationary bike and back to his locker. The scowl he painted on his face during the one-on-one match has washed away. “Paul gives me a hard time sometimes,” Johnson offers. “He’s teaching me a lot of things, teaching me not to jump on pump-fakes and stuff.” The nuances of NBA defense are often the toughest adjustment for rookies, especially college forwards suddenly tasked with guarding nimbler wings. The game-situation, one-on-one drills are designed to help players like Johnson and Stone adapt. “You gotta learn how to close out on guys, not give up threes, be able to run them off the line and send them to your help,” Johnson explains. Yet playing Pierce in the isolated setting can prove far more complicated. His mastery of misdirection has fooled defenders for nearly two decades, to the point where a few minutes later, Pierce will announce to the room that “Toronto and the Knicks don’t ever have to worry about me again” once he retires.